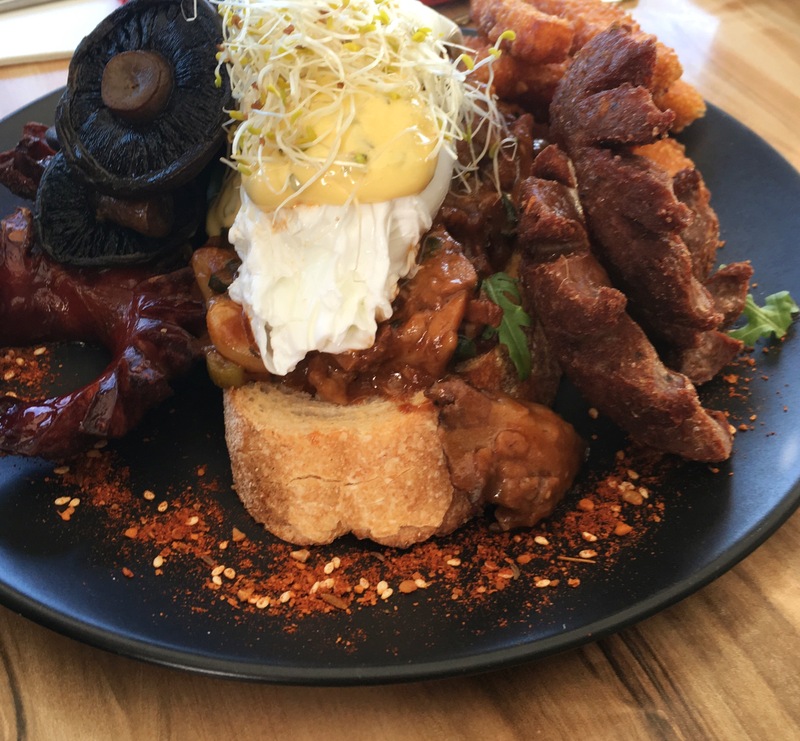 Located on the busy Macgregor Terrace in Bardon, one of Brisbane’s, inner Northen Suburbs, the airy and bright Smoked Paorika Cafe was this weekends breakfast choice. 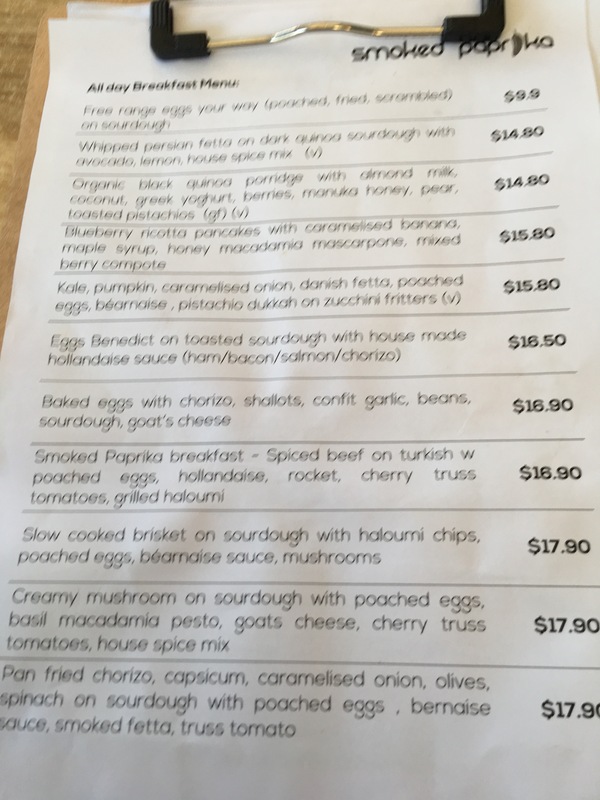 An intriguing all day breakfast menu, detailing some interesting sounding choices, which, make the final choice of meal all that more difficult. Friendly staff brought chilled water and glasses to the table taking an upfront drinks order, then leaving us to peruse the menu. Loose leaf tea on the menu here, which makes a nice change from teabags. However the hot chocolate above is certainly an eye catching drink. 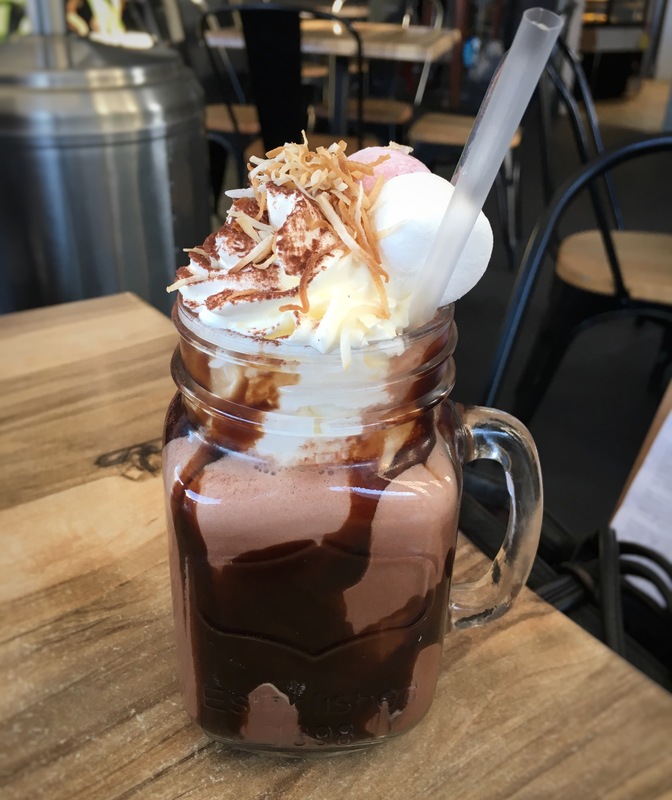 Wonderful chocolatey blissfulness, topped with cream and marshmallows, this hot drink was akin to sneaking in a dessert before your meal! 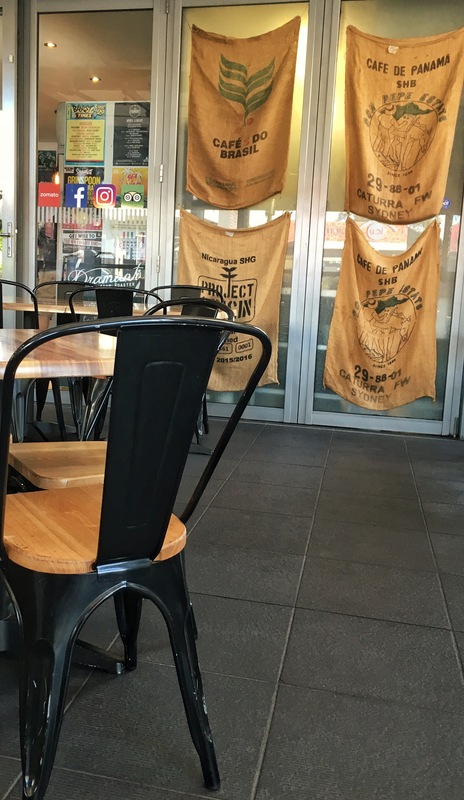 Simple surroundings, with a nice touch of hessian sacking and neatly written appealing blackboards adding to the friendly simple ambiance. With the appealing presentation of the hot chocolate raising the bar, one was left wondering what delights were to follow with the meals, could they match or exceed the bar? Suffice to say, we were not disappointed in any way. 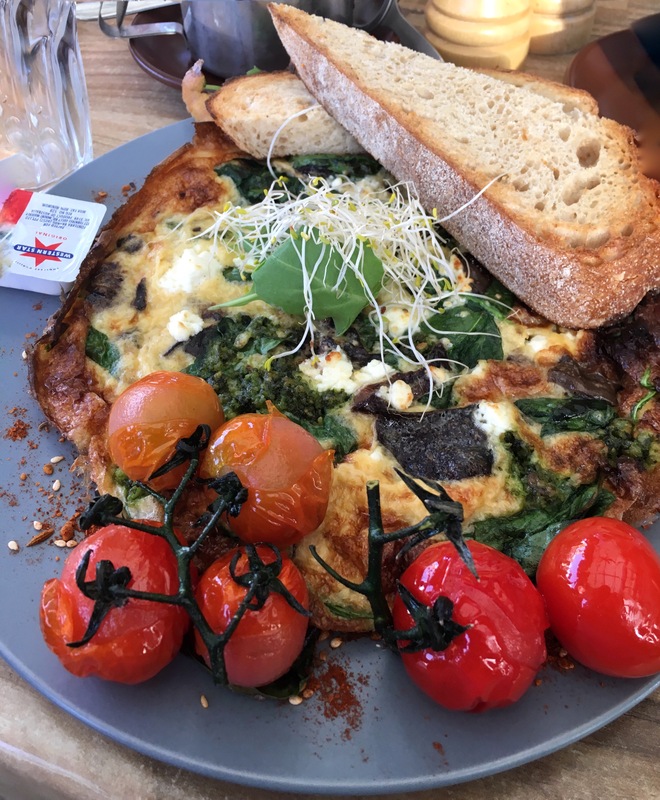 Omelettes come in a number of forms, this particular spinach, goat cheese & mushroom filled Omelette was divine, especially with the tantalising mix of macadamia pesto combined in the dish. Blistered cherry tomatoes were an added extra of my choice. 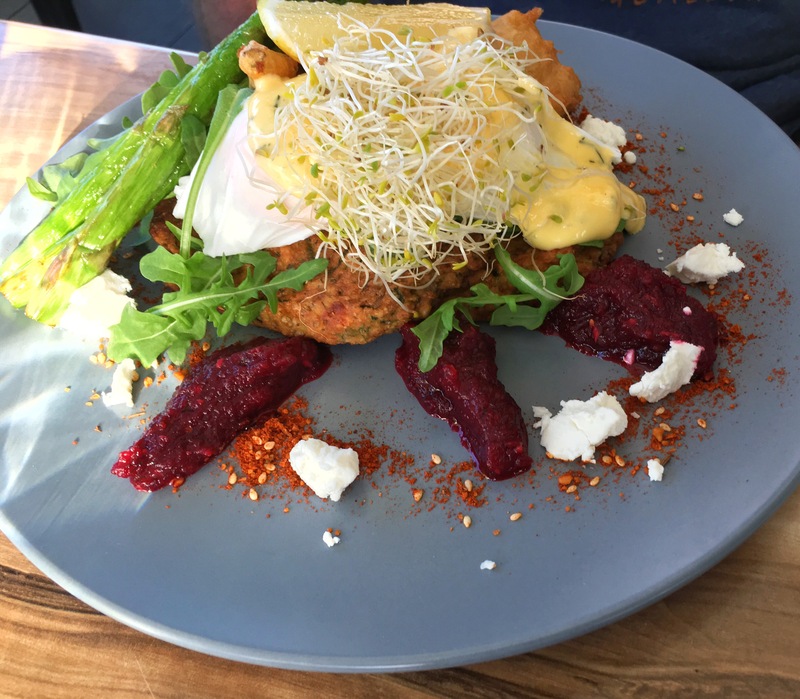 Two of the other meals at our table, included a special of zucchini fritter with an enticing beetroot lending not only a generous dash of colour and fragrance to the dish, but also providing a pleasant accompaniment to the meal. 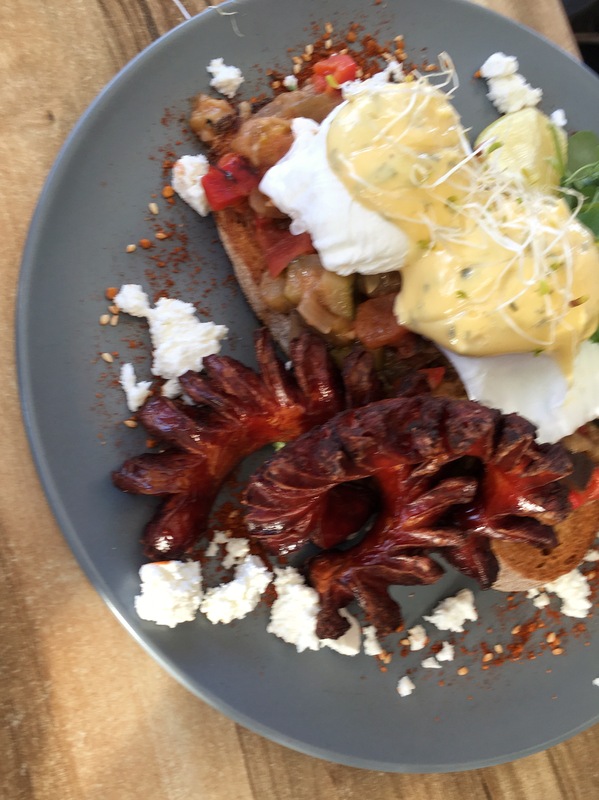 Chorizo spiralled over the delicious ratatouille dish above. Presentation topped off with smoked paprika drizzled around the plate, as in the other dishes. A nice touch given the cafes name. Now this mammoth looking meal was Hubby’s breakfast choice. A superb melt in the mouth slow cooked brisket, served with crispy Haloumi chips, and his additional choice of lamb sausage and chorizo. 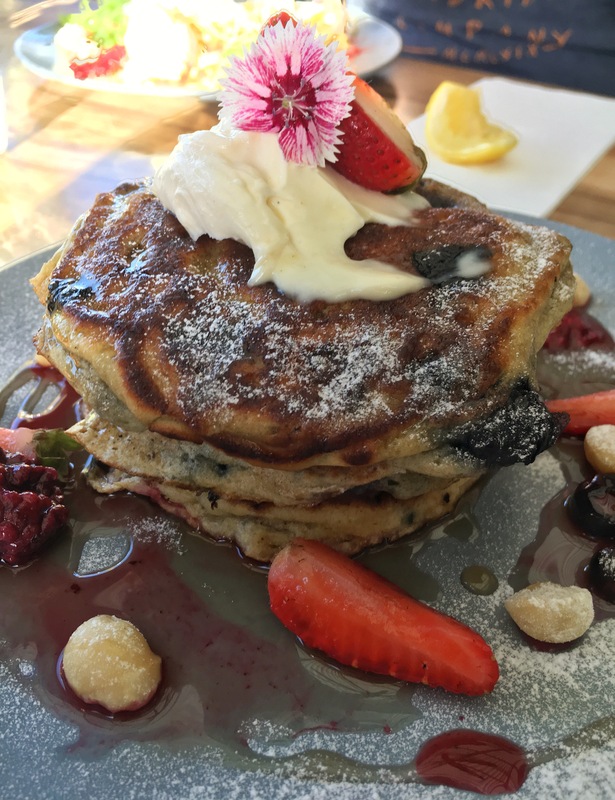 Dessert choice today, soft Blueberry Ricotta Pancakes, drizzled with maple syrup, hiding delightfully velevty caramelised banana, finished with honey macadamia mascarpone, and finally, dotted with mixed berries. A truely heavenly dish. 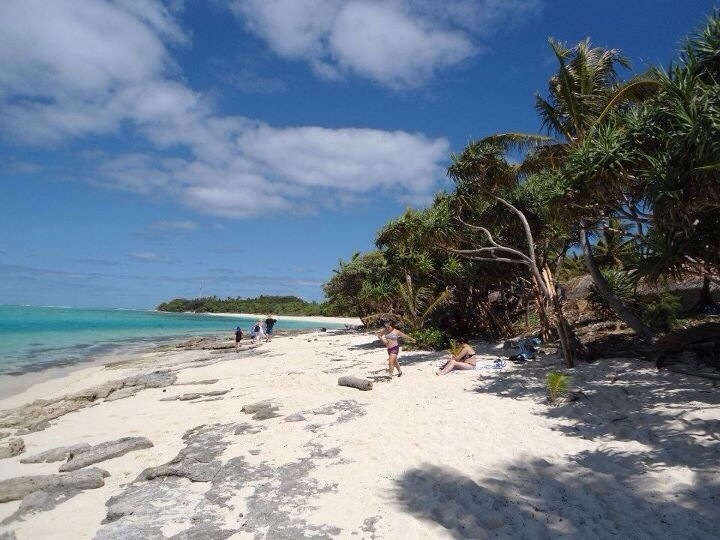 With the menu choices being so enticing, we will return to taste more of the delights on offer. Drop by and check this cafe out. I would highly recommend you do so!